A glorious walk along the seafront this afternoon, bright sunshine, no wind. Girls had the greatest fun in the arcade and won packets of sweets. We finished off the turkey etc for lunch, I loaded them up with leftoveers and now the cat can relax, they've gone. Great composition, love the silhouette. Black and white looks wonderful. Nice! @graemestevens gosh thank you that means a lot to me! B&W success often eludes me, but this is processed to the nth °!! Looks so good in black and white. The only thing I would change about this photo is to either crop or clone out the sun in the top right of the picture because it draws your eye to that spot instead of the rest of the picture. It is only a minor change but would make a huge difference. Still have to fav it though because of the content. @onewing I know!!!! Thought I'd cropped it out but misjudged by a millimetre!! It's a bit of sun flare Babs, could licmonkey it but laptop off and I'm going to bed. Thank you for the fav, despite the editting error. I'm not sure how it could be done differently, maybe a longer exposure, but the dark background on the left doesn't give the contrast that would emphasize the silhouette better. Still a lovely photo. Wow... the clarity of the silhouettes is superb! @overalvandaan poor Lodger!! She's fine now and we had a hoot,! 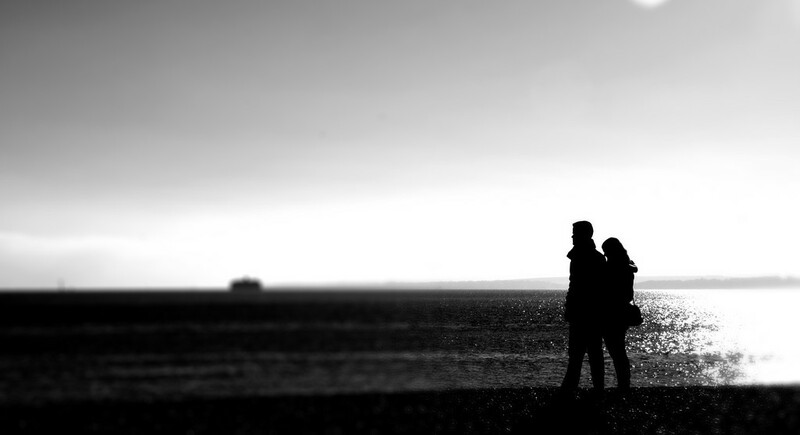 Excellent selective focusing on the silhouetted couple as what they gaze at becomes a soft focus. Love this water scene. And a lovely black and white. Wow thank uou @northy ! @farmreporter it's a miniature filter! Not my skill at all! !